Dr. Jones graduated from Purdue University in 1998. 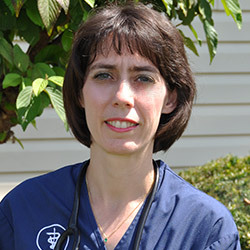 Since then, she has had a variety of experiences, including teaching in a veterinary technology programs and working in a feline-only clinic in Indianapolis for over 5 years. Don't let that fool you, however, she still loves dogs, too! She and her husband, Lewis, met through a medieval reenactment organization. They have two sons, Alex and Liam, who keep them very busy on the baseball fields. In her free time she loves to read and sew.